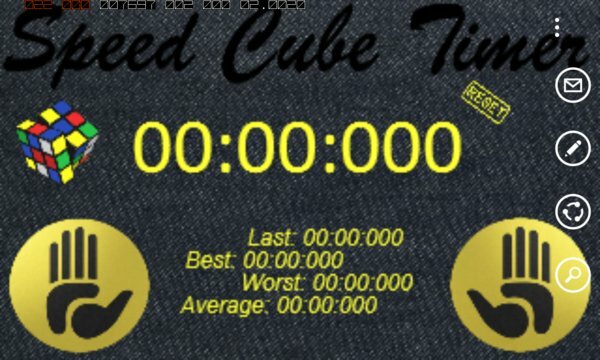 Welcome to Speed Cube timer an app that promises to keep track of your Speed Cube solves with its beautiful and easy to use timer. But the timer is not the only feauture! You can use Speed Cube Timer to generate random scrambles and learn how to solve a Rubik's Cube! Don't forget you can always use it to many more tasks that require keeping track of time. -Big and easily readable timer for convenient viewing. -Statistics about your best, worst and last solves. -Average of all your last solves. ***** Learn how to solve the Rubik's Cube. -Programmed to keep your smartphone awake while the timer runs. How to use Speed Cube Timer: To start the timer tap on the two yellow buttons using both of your hands. To stop it tap anywhere on the screen. 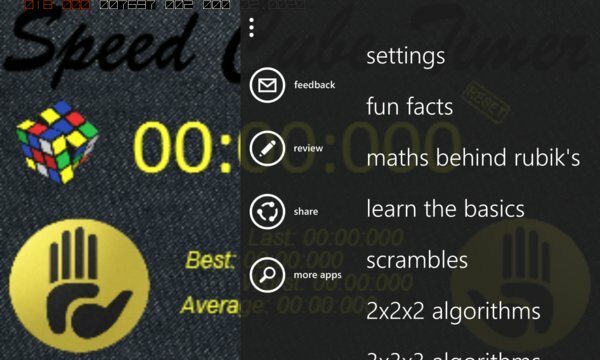 Speed Cube Timer was desinged and developed for Windows Phone by a Windows Developer and Speedcuber. I hope you enjoy using it as much as I enjoyed building it! If you have any questions, suggestions or you want to report a bug please do not hesitate to contact me. Happy SpeedCubing! Please note that Speed Cube Timer is not a game but a utility which helps you by keeping track of your SpeedCube's solves.